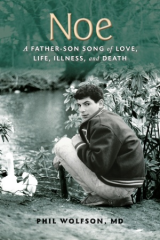 Eric Wolfson has created a short film that captures the essence of his father’s memoir. In this deeply personal video, Phil, Eric and Alice, Noah’s mother, speak openly about his life, his illness and their hopes for how this book might touch others. Please watch. If it moves you, we hope you’ll consider sharing it. This entry was posted in Book, Family, Publicity, Video and tagged book, family, publicity, video. Bookmark the permalink. This ‘trailer’ is a profoundly moving, authentic, passionate and beautiful tribute to Noah! I feel certain he’s laughing with pride and joy for what you two have accomplished — with his subtle influence. I was moved to tears, can’t wait to read the actual book that has taken almost a generation to complete. I didn’t know about the book until today. And I am ordering it right away. I always think about Noah at this time of year. How wonderful that you completed it. I wish I could be at the launch party. I’m on my way out of the country for a few weeks, but I will blog about it and spread the word when I return. Eric’s video made me cry and feel so much all over again. May your words reach many. Sending you love..